Is Fastnet A Harrison Butler Designed Boat ? At the HBA we routinely deal with the owner of a boat they believe to be built to one of Harrison Butler's designs. Upon investigation, most are not. 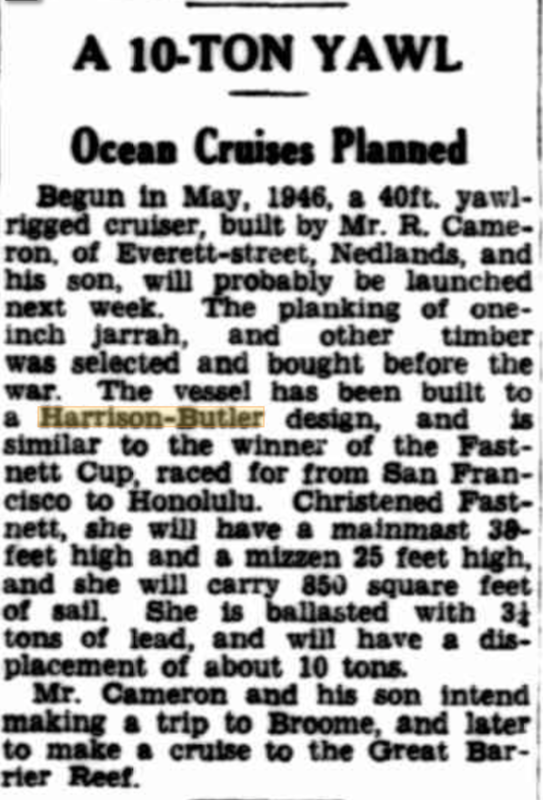 However, a lot in this newspaper clipping rings true of a boat built to the Fastnet design; the length of 40 feet is correct, as is the displacement of “10 Ton”, and the sail area of “850 square feet” is spot on. 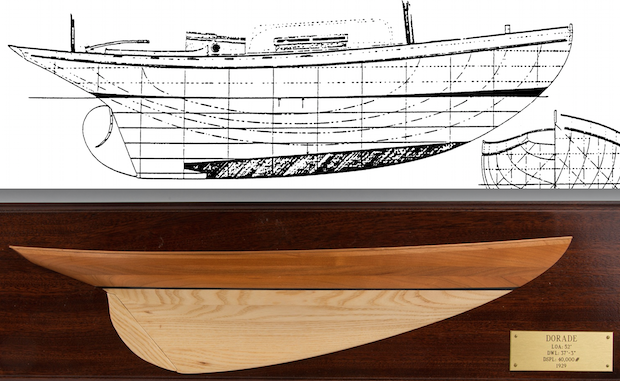 The 3¼ ton keel is the right weight; the design specifies Iron, this has lead. The hunt is now on for further evidence of what became of Fastnet. Previously, only two boats were known to have been built to this design, Galatea built in 1931 also in Sydney, Australia and Sea Salter built in the UK in 1931 by Anderson, Rigden & Perkins. There seems to be a muddle in the article about Ocean Races. The UK's biennial Fastnet Race runs from Cowes on the Isle of Wight to the Fastnet Rock off Southern Ireland and then back on a reciprocal course to Plymouth. 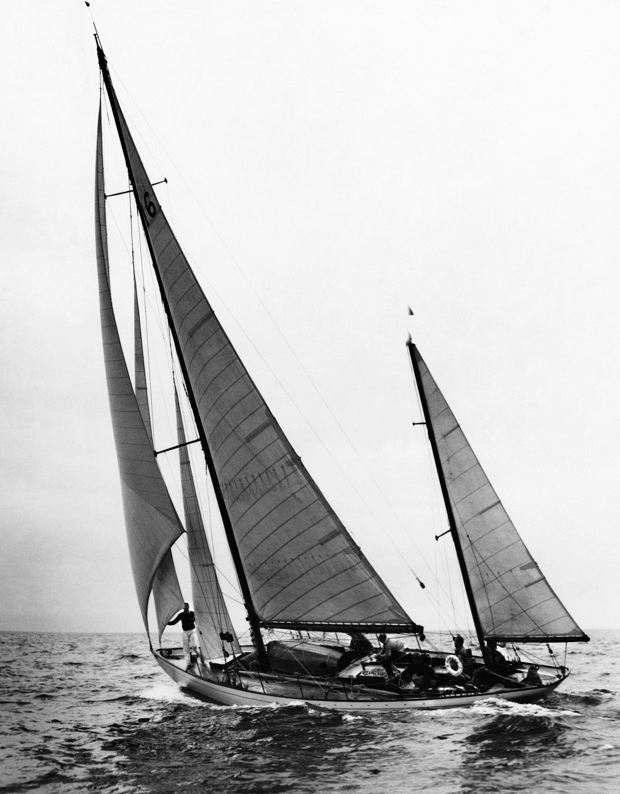 The race referred to from San Francisco to Honolulu is a Transpacific race, won, for example, by John Myron Spaulding in 1936 as skipper of Jim Flood's 52-foot yawl Dorade. 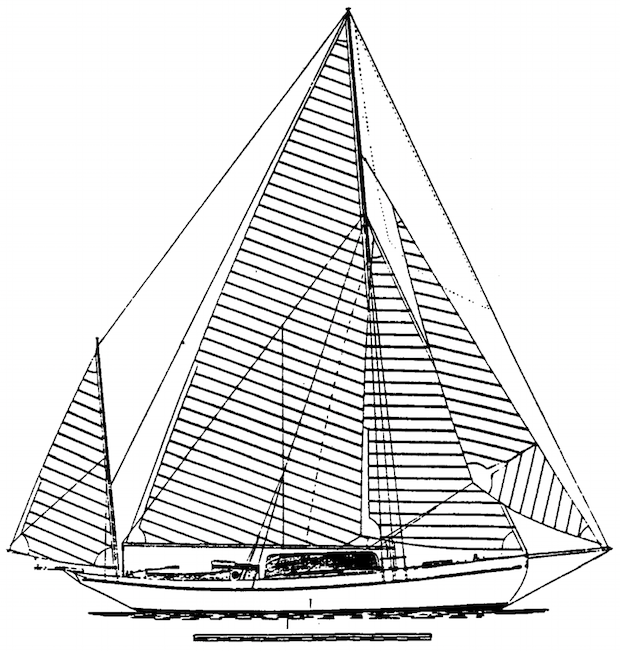 Harrison Butler's Fastnet design (upper) from 1928. It is speculation, but I am wondering if the design that is referred to as being similar to Harrison Butler's Fastnet design, is that for Dorade. The Harrison Butler design is 12 feet shorter and so less expensive to build, but still with reasonable accommodation at the expense of the Sparkman & Stephens faster hull. Olin Stephens at the helm of his influential yawl Dorade, c1930.